The principle of operation is based on high-temperature evaporation of a solution of the active substance (thymol, oxalic acid) with a solvent (ethanol 96%). 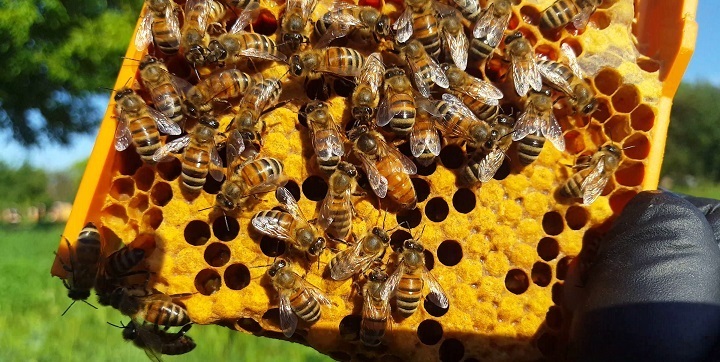 Intensive dose-evaporation of the active substance in combination with a strong irritating effect (heavy traffic of bees, which leads to better shattering of mites) caused by evaporation of the solvent gives high performance treatments. The solution can be successfully used in the production of environmentally friendly (bio) products. 15gr of oxalic acid is added to 100ml (96%), to heat stirring in bain-marie (t 40-50C.) until complete dissolution of acid crystals. To the resulted solution add 10gr of thymol, stir until complete dissolution. The working solution of the mentioned composition is well evaporated without forming crystals of oxalic acid in the system or the tube during processing. Each colonie will be treated with 2-4 ml of solution depending on its size. If there is a brood in the nest, treatment is carried out four times with an interval of 3 days. Compliance of interval of summer treatment (due to the biology of the Varoa mite) is an essential condition for the destruction of the mite leaving the brood. In a broodless autumn period, it is preferably to carry out treatment at air temperature of 2-8С. Under these conditions, the entire mite, that fell down having no contact with bees, dies. It is enough to hold the treatment 1-2 times at intervals of 3-4 days. Puffs of smoke is advisable to enter the nest of bees with an interval of 5-10 min. for loosening cluster of bees and improvement contact of bees of the whole colony with smoke. It is important to use mitecatching grid during treatment with any drugs and ways. Having grids reduces to a minimum the appearance of resistant mites to a particular drug, increases the efficiency processing. Before and after final autumn treatment, bee families should be necessarily checked on the subject of mites.